After wearing your jewelry, gently wipe them with a soft polishing cloth to remove oil and grime. Take your jewelry off before bathing/swimming, dying your hair, playing sports or doing tasks and housework. If your jewelry hits a hard surface, it can crack or chip the gemstones. The chemicals and solvents found in household products can also have a chemical reaction against your jewelry. Clean and inspect your jewelry regularly. Please see Cleaning Jewelry section below for more details. Avoid prolonged exposure to the sun and heat. Like our skin, heat and harmful UV rays can affect the color of your gemstones or even fracture them. Take an inventory and pictures of your jewelry pieces. Jewelry can get lost or stolen. Store jewelry by individually wrapping the pieces with cloth or tissue paper. Pearls can easily be tarnished and scratched. Bring your jewelry pieces to be professionally Checked and Cleaned at Silverberg Jewelers every 6 months. Avoid cleaning damaged jewelry and take it in to repair as soon as possible. If using a sink to clean jewelry, use a strainer, drain stop or rubber mat to help prevent loose gemstones and other small pieces from falling into the drainpipes. 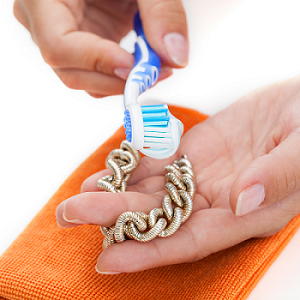 Use a premixed jewelry cleaner or a part warm water and mild ammonia solution with a soft bristle brush. Jewelry cleaner can be purchased from our store. Wearing white gold jewelry pieces over time will wear out the rhodium (white gold) plating causing the yellow gold underneath to appear. Your pieces will need to be rhodium plated once in a while to restore the color. Use a soft, lint-free cloth to polish your pieces after wearing. Do not use any harsh chemicals, alcohol, or ultrasonic cleaners to clean your pearls. Use a very soft brush (such as a powder makeup brush), warm water, and mild soap. Allow the pearls to dry on a towel before storing or wearing. The string can stretch and become dirty more easily while it’s wet. Bring your frequently-worn pearls in to be restrung every couple of years. Knotted pearl restringing is recommended to prevent the pearls from getting lost if the string breaks. Take off your pearl jewelry before dying your hair, and using hairspray or even some soaps. When mailing jewelry by the United States Postal Services (USPS), it is always best to insure it and send it by Registered Mail. Use two boxes to ship your jewelry: one to hold the jewelry and an outer larger box to hold the first. Pack the box with tissue paper or other packing material to secure your jewelry pieces in the first box. This will prevent your jewelry from moving around in the box. Securely pack the box inside the outer box with packing material. Make sure the inner box is not in direct contact with any of the edges of the outer box. Seal all edges of the outer box with tape. Do NOT include any information on the outside of the box that may indicate there is valuable jewelry inside (e.g. if shipping to a jewelry store, do not reference the word Jeweler or Jewelry). Insure the shipment, require a signature upon delivery, and obtain a tracking number. Do not use a drop box. Go to the post office and have a USPS postal worker handle the box directly.